If there is anything that can be said about most acne treatments, it is that they are designed for people with fair dry skin who have more of a problem with pimples than with whiteheads, blackheads, cysts, or rosacea. In other words, most acne treatments are designed for white people. Dermatologists in the United States and Canada, however, are becoming increasingly sensitive to the special needs for skin care designed for people of color. People with darker skin tones experience discoloration, since the skin produces more melanin as it heals, in order to fight inflammation. What’s Different About Dark Skin? The most common skin condition for people of all races and all skin tones is acne. The results of acne are very different on darker skin. Most people who have fair skin are more concerned with pimples that may remain on the skin for a few days to a few weeks. Most people who more richly toned skin are more concerned about brown pigmentation left behind with pimples heal, that can last for a few months to a few years. The reason dark skin gets darker when pimples heal is the way the skin responds to inflammation. The process of inflammation is activated by free radicals of oxygen. The melanin pigment in skin absorbs free radicals of oxygen. Skin makes more melanin as it heals to fight inflammation. Almost all skin darkens after acne heals, but people who start with darker skin have more pigment-producing melanocytes. 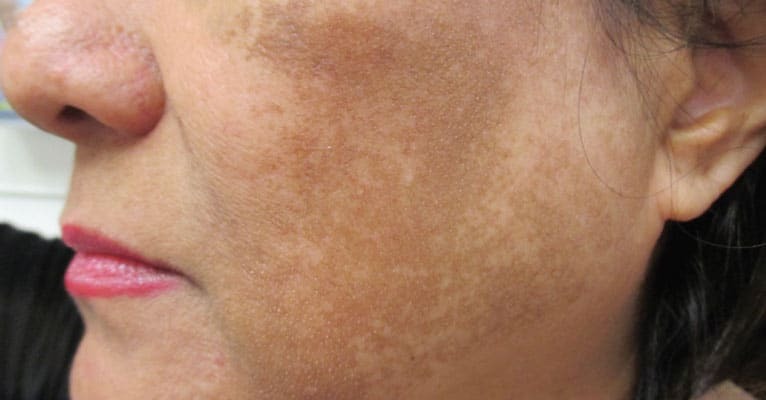 Their skins may heal faster, but they also produce spots that are much more noticeably darker than surrounding skin. Fighting acne inflammation with products that use inflammation to kill bacteria can cause long-term problems on dark skin. People who have deep golden skin tones associated with Asian skin, especially people of East Asian descent, have other skin issues. Some East Asians lack a gene that codes the protein that creates an enzyme that recycles the amino acids tyrosine and phenylalanine in the skin and connective tissue. They tend to accumulate black and blue pigment even when they are not exposed to chemical treatments for acne, but using the skin lightening agent hydroquinone—often recommended for freckles and age spots on fair skin and included in all skin lightening products in the famous (and otherwise excellent) Murad product line—greatly accelerates the process. Exposure to many chemicals used in industrial processes or created during the refining of oil into petrochemicals can also leave black and blue blotches on the skin. Some of the environmental pollutants that cause some of the worst problems are benzene and phenol. Cosmetic disasters are most likely to occur when people who have Asian skin tones and who lack the genes for the enzyme use hydroquinone to remove brown spots and then are exposed to vapors from oil refineries. The combination of genetics and chemical exposure can be extremely difficult to correct. People of Asian, African, Middle Eastern, Native American, Pacific Islander, and Latin American descent are prone to other skin issues. Sometimes the problem is diagnosis. The textbook image or the photo on the Internet that depicts a whitehead, blackhead, pimple, papule, pustule, or cyst on white skin may not be very helpful in recognizing the same kind of blemish on colored skin. Other times the problem is choice of treatment. Any kind of treatment that causes inflammation, such as a skin peel or laser ablation, will have longer-lasting effects on darker skin. Techniques that are safe on fair skin can make beauty issues on darker skin. And another issue is that scarring does not always take place in the same way on different types of skin. People who have fair, white skin tend to develop long-lasting scars after they have pimples. Even scars can develop new scars on fair skin. People who have darker skin sometimes develop acne scars where acne was not visible at all. Blackheads, whiteheads, and unblemished skin can all be followed by acne scars, but these scars may resolve themselves more quickly than on fair skin. Some states of the USA, such as Texas and New Mexico, are already majority non-white. Other states, such as California and Hawaii, will be non-white by 2020. By the year 2050, the majority of Americans will have dark skin—and dermatology will have to adjust to the new realities of skin care treatment. If you have dark skin, the good news is that it is going to be easier and easier to find appropriate treatments and doctors who understand your skin needs. If you have fair skin, don’t worry about being left out just yet. The overwhelming majority of acne products are still designed to work best on pimples on white skin. But always take skin tone into consideration when choosing the products that will get rid of acne for good. Q. Are there any skin tones that have particular kinds of acne problems? A. Just about anyone can have just about any kind of acne regardless of skin color. However, certain skin colors tend to have certain skin problems. People who have Asian, Native American, or Pacific Island skin tones tend to have more problems with pigmentation after acne (whiteheads, blackheads, or pimples) heals than while it is active. People who have skin tones common in Latin America tend to get very few pimples as teenagers but develop cystic acne in their 20’s. People who have African skin tones tend to have more problems on the neck and scalp. People who have fair skin ten to have pimples rather than blackheads, and acne problems that are more closely tied to allergies and chemical sensitivities. Q. Is there any one chemical that people who have dark skin should avoid? A. More problems arise from the use of hydroquinone-based skin lighteners than anything else. These products don’t just cause discoloration on Asian skin. They can also cause problems for people of African and Middle Eastern heritage. Use arbutin, kojic acid, or microdermabrasion instead.